The Goal Diggers (Peter Zhengyang Pan, Sam Stumborg, Rubing Bai, Dafne Delgado, and Mikayla Preete), after extensive consultation with their clients FortisBC and BC One Call, decided to create Contractor City, a mobile idle game. Ian Turnbull, a construction and pipeline safety expert, helped the team discover that younger contractors aren’t aware of the BC One Call animated ads. As a result, these contractors are at an increased risk of striking a pipe. As a solution to this knowledge gap, the team proposed a game. The game idea eventually became Contractor City. Rather than a traditional "win/lose" video game, Contractor City is an idle game that plays itself while you’re away. Like a stock portfolio that constantly accrues interest, idle games push the envelope of what it means to be a videogame because so little player interaction is needed. Pocket-sized, easy to play, Contractor City aims to teach the player how important it is to know what’s below by rewarding safe ground disturbance practices and punishing dangerous deeds. As a way of rewarding contractors, there is an option that allows players to turn their real-life BC One Call reference numbers (a number you receive when you call their service) into in-game currency rewarding real-life safety with in-game success. All in all, the game aims to make lasting behavioural change by encouraging repeat use, safe practices, and BC One Call membership. With a focus on human health, MDM team Viva la Vida’s project is the kind of serious game that could get invited to the 2020 Serious Games and Applications for Health conference being held at the CDM next summer. Laureen Wales, the CEO of Your Viva, approached the Centre of Digital Media looking to build an installation on the University of Alberta campus that would encourage students to get fit on their way to class. Like the Goal Diggers, they were being tasked with instilling behavioural change in a younger audience. After a lot of testing and research, the team convinced Laureen an installation was the wrong solution. Instead, they landed on a game where every step is rewarded, individual actions benefit a team, and specific physical activities are assigned as quests. Team Viva la Vida’s product is an augmented reality app with game elements that reward and engage the player. When Pokémon GO! launched no one expected there would be healthy and beneficial outcomes. The members of Viva la Vida (Emily Cao, Ghazal Jenab, Hang Zheng, Isabelle Rash, Shervin Mortazavi and Ziyi Xu) worked backwards, from the intended benefit toward an augmented reality game with teams, territories to capture, and a map built from Google Maps. Instead of ignoring the health benefits, they doubled down, tying the player’s progress in the game to in game exercises, activities, and social engagement. 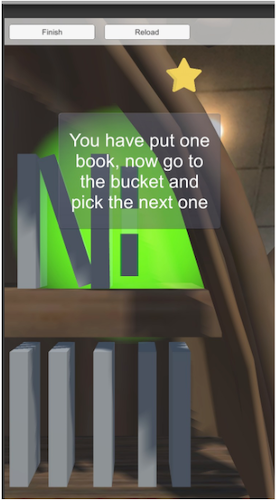 Exercises include activities like "shelving books" where the player has to move their phone up and down as if they were taking books off a high shelf and putting them on a lower on. This is actually a repeated stretching motion under the guise of "shelving books" but it and other activities help the user move and keep active without it obviously being exercise. As team Viva la Vida found out, the biggest barrier between an inactive student and exercise is mental. While the first two groups had to convince the client that a video game or gamified digital content was a solution to their problem, Dr. Claudia Krebs approached the CDM specifically looking to build a game. 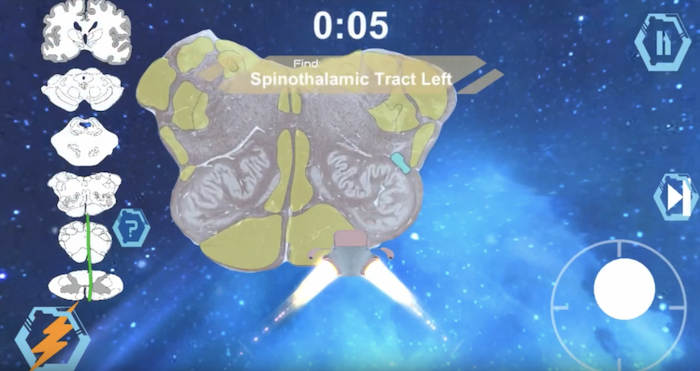 In this case, a game for medical students that would help them better memorize brain structures for their neuroanatomy courses. After significant research and development, team Brain Bros (Julia Lastovikova, Kimberly Ann Burke, Niccolo Pucci, Oliver Riisager, Sean Jeon and Weiyi Zhang) built Cerebro, a 3D game that you play on a mobile phone. In the game, the player aims a robot (named NeuRob) to fly through the parts of the brain and spinal cord. Memorizing the structures helps them rack up points in the game and (one hopes) points on their exams. Both the Brain Bros and Viva la Vida teams have joined an exciting field that blends health science with videogames. Indeed, health and videogame professionals are working closer than ever before with neuroscientists like Adam Gazzaley building the case for the medicinal benefits of video games. Rather than simply training doctoral students, encouraging physical activity or behavioural change, Gazzaley’s Neuroscape Lab, Akili Interactive Labs, and others are actively pursuing FDA approval for medicinal videogames. As the world waits for FDA approved medicinal video games the Centre of Digital Media is joining those charging ahead. Vancouver based Biba Ventures, Ayogo (on the same campus as CDM), and Mod7 Communications (now a part of Open Road Communications) are all pioneering in the same space which makes Vancouver fertile ground for serious games. The 8th annual international conference for the Institute of Electrical and Electronics Engineers on Serious Games and Applications for Health (SeGAH) are both coming to Vancouver in 2020, hosted at the Centre of Digital Media. The CDM is a natural fit for SeGAH with a master’s program already building games for real-life applications. With three gamified solutions to professional client problems this semester alone, the CDM can expect to have approximately nine more student projects seriously applying game elements before SeGAH opens August 2020.